Creamy and soft, no bake, lemon curd cheesecake marbled with blueberry pie filling. 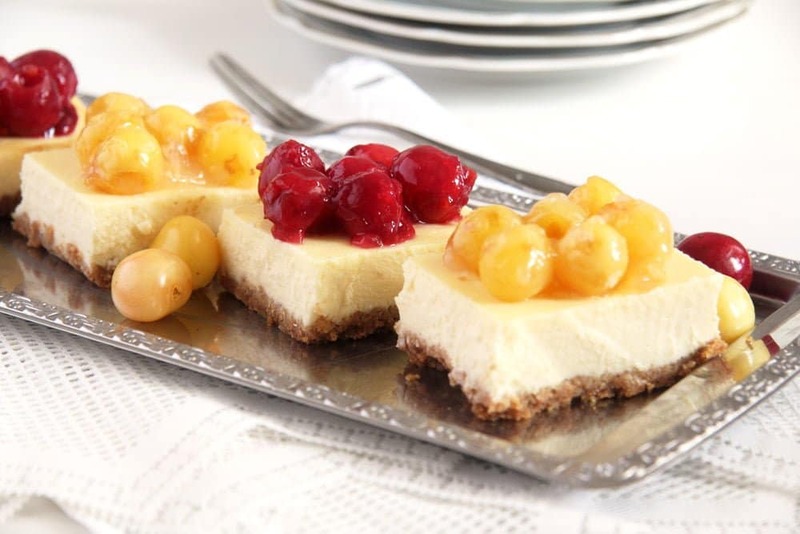 Another favorite cheesecake to start the week. 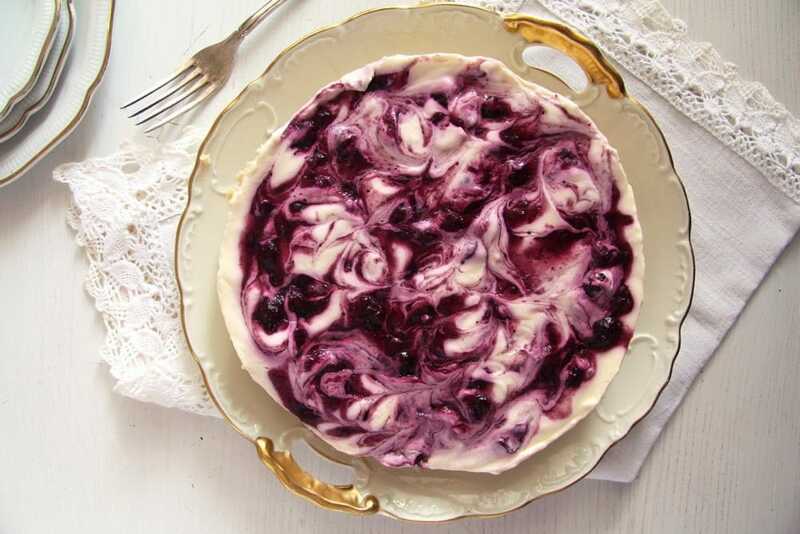 This time the creamiest, softest cheesecake I have ever made, topped with homemade canned blueberry pie filling. A treat for everybody! 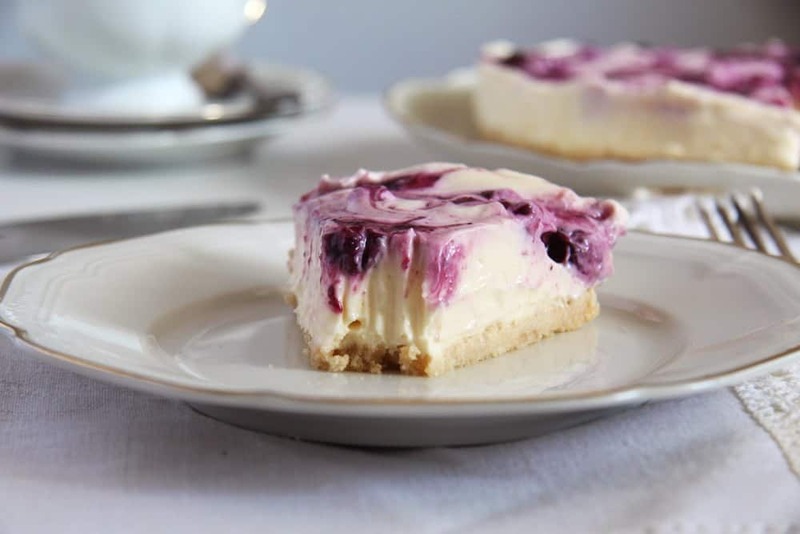 This might also be the quickest, simplest cheesecake I have ever made. Main reason for that is the use of canned ingredients, ingredients I already had in the fridge/pantry, like homemade lemon curd and blueberry pie filling from last year. I still had quite a lot of lemon curd leftover after making the filling for a wedding cake and the last opened jar of blueberry pie filling. 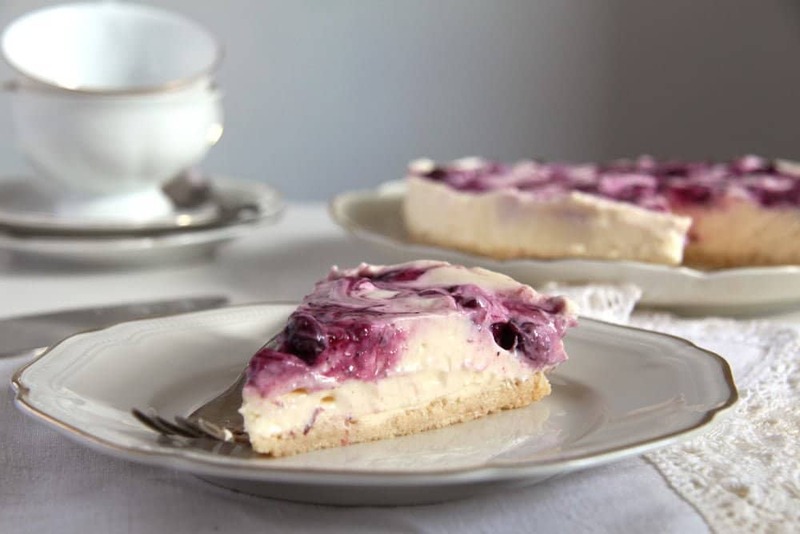 I had opened the jar to eat it over milk rice and I used the rest to marble this cheesecake. I made and canned this blueberry pie filling at the end of last summer and meant to use, well, for making blueberry pies. I have to admit that although I had about 5 or 6 jars of this filling, I have not made one single blueberry pie. We ate all of it, with the exception of this last half jar used for this cheesecake, over milk rice, crepes or pancakes. Amazingly delicious! Of course, if you don’t have homemade blueberry pie filling, you can definitely used the bought version, I am sure it would work just as well. Sorry, for not posting the pie filling last summer, it is too late now, there is nothing left to take pictures of. But as I will make some again in August, I hope to get to post the recipe sometimes soon. Otherwise take a look at this link, this is the recipe I followed. 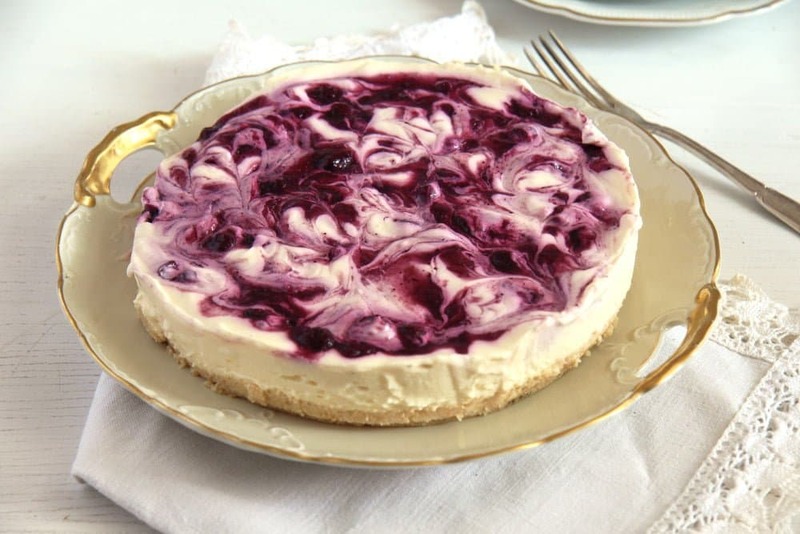 Or you could use this black currant refrigerator jam or this blueberry curd instead, I think it would be great on top of this cheesecake. If you would like to make the lemon curd yourself, this is my lemon curd recipe – the sweet version, the one I make most of the times. You can use bought one as well to simplify the matters. I did not take any sugar when making the filling, I found it unnecessary. Still, taste the mixture and add some if you like things sweeter. The cake is still very soft even after firming up. Keep this in mind when transferring the cake onto a serving platter, you don’t want to ruin its aspect. I loved its softness and tenderness, I think that was the best thing about it, a creamy heaven, I would say. Grease a 20 cm/ 8 inch springform lightly. Line the base with parchment paper. Place the digestives in a food processor and turn them to crumbs. Add the melted butter and mix well. Press this mixture onto the base of the springform. In a larger bowl whisk together the cream cheese, mascarpone and lemon curd until smooth. Taste the mixture and add a little bit of sugar if you find it necessary. Pour the mixture into the springform and level. Add some dollops of the blueberry pie filling all over the surface of the cake and marble the cake using a fork. Place it in the fridge to firm up overnight. Remove the ring of the springform and transfer the cake onto a serving platter very carefully. That's it! Every week should start and end with cheesecake! Especially one this delicious! 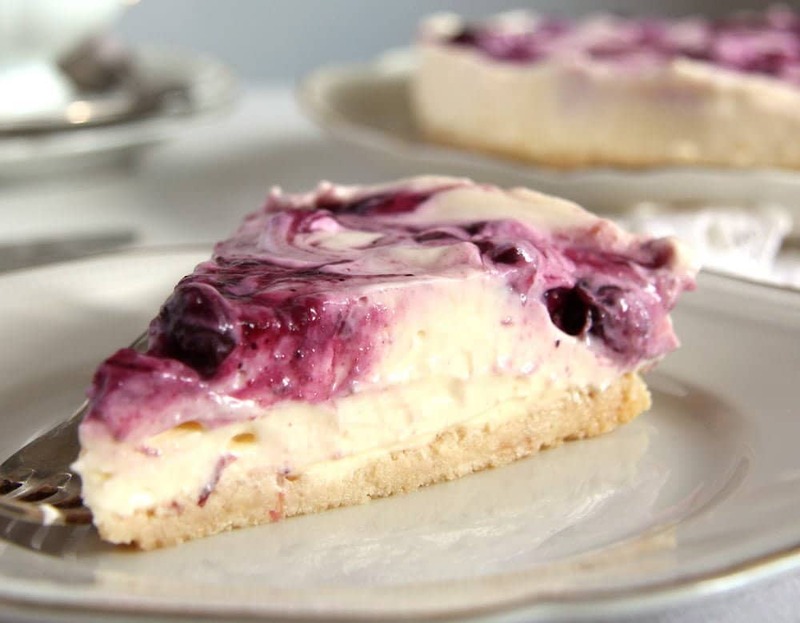 Love the blueberry and lemon curd combo! Cheers! You sure have a lot going on! I’m amazed with how you are managing to get everything done. 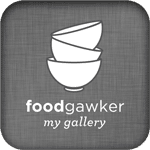 This cheesecake looks divine…and dangerous…because I would want to go back for more! wow this looks beyond delicious! The texture is perfectly creamy and smooth. You are a busy bee! This looks wonderful. I would use my blueberries on this too! Happy holidays! Blueberries and lemons are the best combination. This dessert looks spectacular!